Enthusiasm is growing for a new campground in Grantsburg. Three downtown business owners came up with the idea. The three chose a site on undeveloped village-owned woodland which is west of and separated from Memory Lake Campground. The new campground would be in the woods along Olson Drive set back closer to the Wood River. 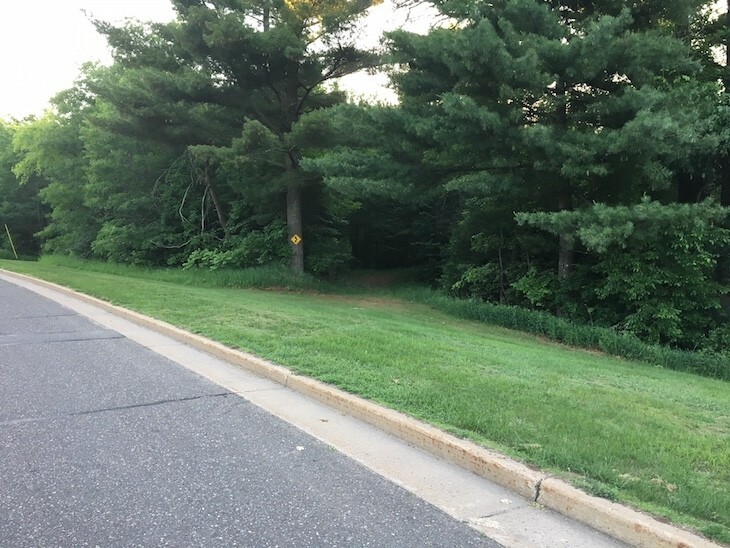 The area proposed for a new campground is north of Olson Drive where it intersects with Wisconsin Avenue, as shown in this photo looking northeast. The business owners want to reach a different camping crowd by having a somewhat more rustic campground for younger campers. The younger crowd that the three owners are targeting usually have smaller camping trailers or prefer tent camping — namely the Millennial generation — those born from 1981 to 1996 who are now 22 to 37 years old. The business owners cited studies showing Millennials spend money, enjoy camping and doing outdoor activities with other millennials or their young families. They don’t mind a longer drive to work if they can live in a nice area. The owners want the campground to serve as an “intro to Grantsburg” for families that already work from home or are looking to escape the busy cities. The three businessmen took their campground brainstorm to the next level. They enlisted the help of a professional site designer who happens to be one owner’s brother-in-law. The designer walked the proposed campground area and put together a comprehensive site plan, mapping out 28 campsites, a one-way road, and a bathhouse, plus water and electricity hookups and a central sewer station. Campground spaces may vary in size or shape in order to keep as many trees as possible. The designer put his findings into a report, just as he does for paying clients, but did it free instead of charging the usual thousands of dollars. One of the three owners brought the idea and report to a recent Grantsburg Revitalization Organization (GRO) meeting. The GRO members loved the plan too. On Monday night one of the owners, Dale Bistram, who is now a GRO member, presented the idea to the village board with help from GRO member Kristina Kelley-Johnson. 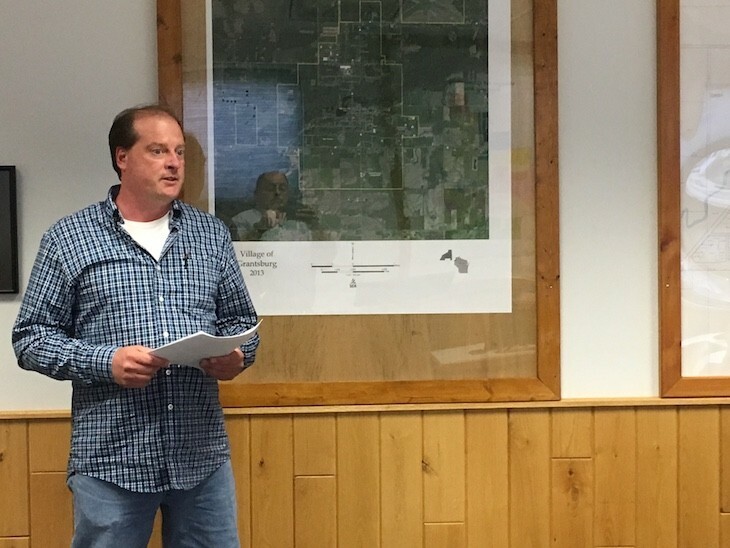 Country Cafe owner Dale Bistram presented the new campground idea and preliminary plan Monday at the Grantsburg Village Board meeting. The village board members liked the plan and approved a temporary committee to do more study and to start looking for funding through DNR funding for parks and outdoor project grant funds through the county. The committee will include village board members, business owners, GRO members and village residents. They will report their findings and recommendations to the board later this year. Bistram’s business pals are Jeff Finch of Hardware Hank and Mike “Hummer” Janke of Hummer’s Rendezvous. Dale said the three friends were hanging out, talking about GRO’s request from for ideas from business owners on how to improve the community. GRO is also seeking ways to attract more young people to visit and get to know what Grantsburg has to offer as a place to live and work — its scenic beauty, its hiking, biking and skiing trails; kayaking and canoeing, it's year-round hunting and fishing, award-winning schools, affordable housing and job opportunities. Village Treasurer Sheila Meyer told the board that before the meeting she had checked with Burnett County about this acreage of village-owned land. “This is not the ‘Boy Scout Woods’ and there are no restrictions on this parcel of land. 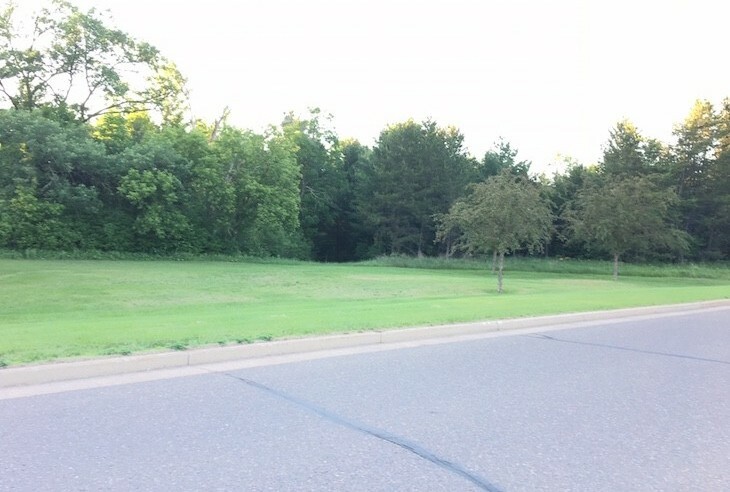 The area proposed for a new campground is north of Olson Drive where it intersects with Wisconsin Avenue, as shown in this photo looking northwest. All but two of the 38 blacktopped Memory Lake campsites are rented for the full 2018 season, leaving only two camping sites available for short-term campers. While the season-long rentals are money-makers for the village, some groups who previously camped at Memory Lake are upset they lost their short-term rental spaces. The demand is strong for more RV and extended travel trailer sites at Memory Lake, so the village board talked of turning the campground’s little-used outdoor volleyball court into three or four more RV spaces.